Thank you for visiting DAN JOHNSON TAXIDERMY. This website only contains a small part of what I have done over the years and there is plenty more to come. I welcome every opportunity to express my abilities with my customers trophies and I am commited to delivering the best quality of work I am capable of doing with every piece, large or small. I stand behind my work for it must stand for me and represent my skills for many years to come. I will ship and recieve your trophies from and to anywhere in the world. No job is to large or too small. Please contact me for pricing. 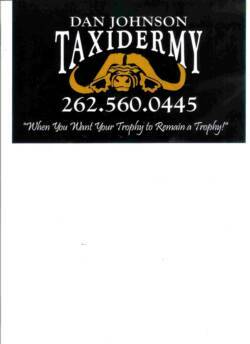 Before you leave for your next Trophy Adventure please contact me. I will gladly discuss any and all trophy preperation, proper field care and shipping or transportation instructions. When traveling out of the country I will provide you with shipping tags, Brokerage Agents and assist you with filling out all required documents to expidite your Trophies back into the country. I make it my job to help you get your Trophies back. "When You Want Your Trophy .......To Remain a Trophy"
FIRST CHOICE TRAVEL: Let the staff at "FIRST CHOICE TRAVEL" help you with the logistics to your next hunting or vacation destination.